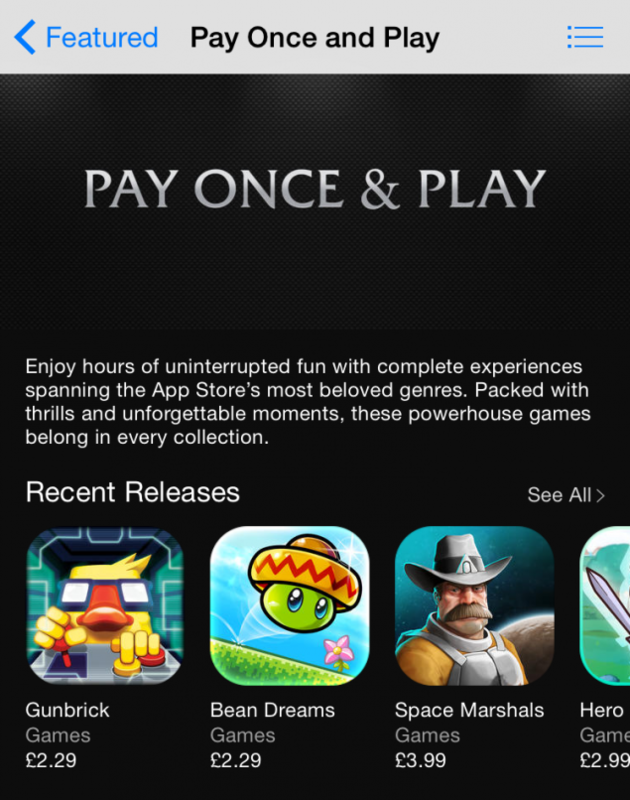 As of today App Store users can expect to find a new category for games labeled “Pay Once & Play”, the games sold in said category will not include any form of in-app purchases or micro transactions, Apple announced today. No pesky in-app purchases in this App Store category! Just last year Apple made a similar change to the App Store, where they removed the word “FREE” from the installation button of any games and apps that were free-to-play and free-to-download, but also included in-app purchases. Nowadays it say “get” instead of “free” for these kind of games and apps. As well as having a disclaimer stating “offers in-app purchases”. Both of these changes most likely came due to the pressure from regulators such as the Federal Trade Commission, that have been pushing companies like Apple, Google and amazon to change their guidelines of how they promote free-to-play games with in-app purchases. Last year Apple and Google had to pay several millions of dollars just to deal with complaints from the Federal Trade Commission over in-app purchases. As well as lawsuits from parents who probably were not so happy about ‘Little Timmy’ spending 6.000$ on virtual nonsense, with the tap of a button. Obviously as a parent, some of it is your own fault, if you allow your child to use a device which is configured with your credit-card information bad stuff can happen. Overall I think in-app purchases are pretty bad, at least 50% of the time, a game will be made in a way, so that after a few levels the games difficulty is artificially increased to the point where you pretty much NEED to buy something for real money. It might also be that the game is created with gigantic time-walls much like the atrocity that is *cough* Dungeon Keeper Mobile *cough* which EA-games tried to get away with.